Aly Raisman might be looking to compete in the 2020 Olympics in Tokyo, but her time competing in Rio has come to an end. While I'm always depressed after women's gymnastics is over, Raisman's final routine at the 2016 Olympics was the floor exercise and it was the perfect way for her to finish in Rio. 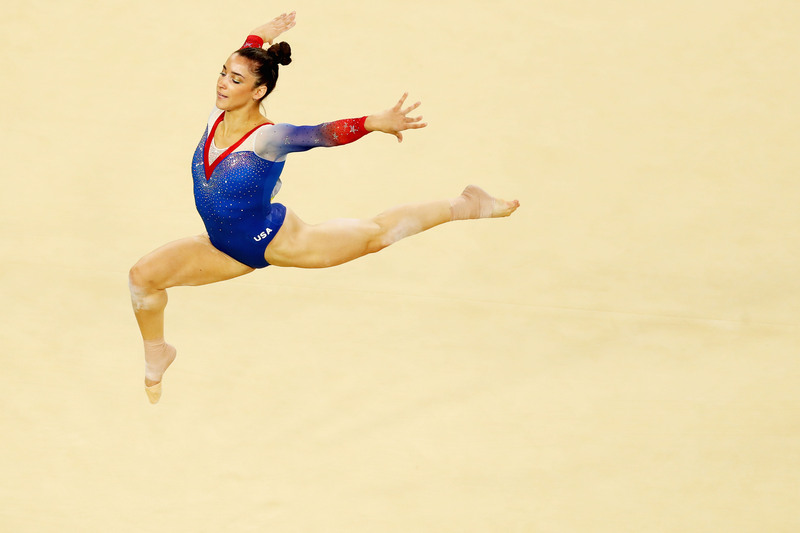 The floor is Raisman's most dominant discipline and she proved that once again by earning a silver medal on Aug. 16. Raisman fans have a long four years ahead to see if she will return as an Olympian in Tokyo, so the best way to deal with this anticipation is to watch Raisman's last performance on the floor at the Rio Olympics, which contains four chill-inducing and nearly flawless tumbling passes. After she was brought to tears upon nailing her floor routine during the individual all-around competition (where she also won silver and brought me to tears too), Raisman was back on the floor one last time. She was the reigning gold-medal champion in the floor exercise and though she really wasn't expected to win gold again in Rio, it didn't make her accomplishments on the floor any less spectacular. The reason she wasn't the front-runner had nothing to do with her not being as strong as she was in London — actually, the opposite is true since Raisman told Bustle before the Rio Olympics, "I feel stronger than I did four years ago" — it was because of the difficulty level that her teammate Simone Biles can tackle. Joe Posnanski explained the evolution of gymnastics scoring for NBC's Olympics coverage and wrote, "The harder the routine, the higher the possible score." So, what made Biles nearly unbeatable is the fact that, as Posnanski wrote, "Biles' floor exercise is the hardest in the world, the hardest in the history of the world." And Raisman, like the classy, dedicated Olympics champion she is, had come to accept that. As she told USA Today after her final performance, "I knew that the gold was out of the question so the silver for me genuinely feels like the gold medal." She also echoed the sentiment she had told Bustle pre-Olympics saying, "I feel like I'm better than I am in 2012, so I'm very proud of that." And how could she not be proud? Although Biles was the favorite to win and did secure gold, it doesn't take away from Raisman's silver-winning floor exercise and I can guarantee that any gymnastics fan will want to be mesmerized by her first pass again. The commentators noted how packed that first pass is with a double Arabian and a punch front layout and every time I watch, it only gets more impressive that she lands so neatly in that little corner of the floor like the superstar Olympian she is. Her second pass is not available on social media — you'll need to go to NBC's Olympics page to watch Raisman's floor exercise in its entirety — but you can check out her third and fourth passes on the NBC Olympics Twitter page. The height she gets on that double layout in her third pass is crazy high and each of her landings were so miraculous in how clean and powerful they were. While I had been nervous watching her the first time around (though I'm sure I wasn't nearly as anxious as her parents), upon rewatching, I can see I had nothing to fear. Raisman comes off like a true professional competitor with confidence oozing out of her outrageously muscular body (you can see her abs through her leotard!). Raisman earned a 15.500 for her final competitive exercise at the Rio Olympics and was awarded with a silver medal as she stood next to Biles on the podium. Her sixth Olympic medal looked to be as sweet as the first and while you wait with bated breath to see if Raisman can return for Tokyo, know her final Rio routine is always here, waiting to be watched, when you need a dose of epic inspiration.